This uncommon and interesting name is of Norman origin, introduced into England after the Conquest of 1066, and is derived from the Old Norman French form, "Wisc(h)ard", of the Old French personal name "Guisc(h)ard, Guiscart". The given name is ultimately of Old Norse origin, and was formed in Normandy from the Old Norse elements "viskr, vizkr", wise, and "hard", hardy, brave, bold, or perhaps the Old French intensive suffix "-(h)ard". The first recording of the personal name is in its Latinized form "Wischardus", in the Bedfordshire Pipe Rolls of 1176; one Guichard de Charrun is listed in the "Inquisitiones Post Mortem" of Northumberland in 1270. 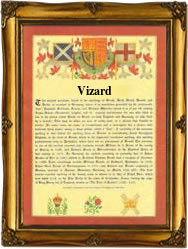 The surnames derived from the given name range from Whiscard, Wishart and Whisker, to Wiskar, Wisker, Wesker, Wysard and Vizard, and is found particularly in Scotland in the form of Wishart. The first recording of the name in Scotland is that of William Wischard, a charter witness in Cambuskenneth, circa 1200. Recordings of the name from English Church Registers include those of the christening of Gabriel, son of John Vizard, in 1568, in Buckland, Gloucestershire, and the marriage of William Vizard and Margaret Pratte, at All Saints, Worcester, on October 2nd 1618. The family Coat of Arms is per fesse silver and red, with a fesse engrailed per fesse blue and gold, between three esquires' helmets proper, in the centre chief point a red cross crosslet. The first recorded spelling of the family name is shown to be that of Walter Wiscard, which was dated 1162, in the "Pipe Rolls of Surrey", during the reign of King Henry 11, known as "The Builder of Churches", 1154 - 1189. Surnames became necessary when governments introduced personal taxation. In England this was known as Poll Tax. Throughout the centuries, surnames in every country have continued to "develop" often leading to astonishing variants of the original spelling.